SharePoint, ThoughtFarmer, or Both? What’s best for you? Considering a SharePoint Intranet? ThoughtFarmer makes it easy to manage two scenarios: Those who want to continue leveraging a SharePoint, and those who want to migrate away from it. Move over CX, there is a new buzzword in town. It’s a question we hear often, particularly when people are investigating the role of a SharePoint intranet, and trying to determine whether to ditch it, or continue supporting it. Many of our customers come to us with existing SharePoint implementations. And while many are eager to move away from Microsoft’s solution, some are reluctant and want to learn how they can continue to leverage the infamous platform. When it comes to co-existing with SharePoint, ThoughtFarmer makes it easy to manage two different scenarios: Those who want to continue to leverage SharePoint, and those who want to migrate away from it. Most of our customers will want to leverage all the functionality of ThoughtFarmer, but, if you want to continue enjoying your SharePoint set-up, we have a plan that will allow you to do that, too. No outsider or vendor can tell you with complete certainty what will work best for your organization. We will, however, share some of the known benefits and considerations for those considering a SharePoint intranet. We will also take a look at the different journeys that two of our customers have taken relating to SharePoint. If you are unfamiliar with SharePoint, it is Microsoft’s solution to collaboration and document management. It can be hosted on-premise or in the cloud and is currently offered with the enterprise-level Microsoft Office 365 productivity suite. At first glance, SharePoint is enormous, intricate, and complex. And it can be difficult to get your head around the endless list of features that everyone promises will help your business. But as intimidating as SharePoint can be, it is also highly functional and extremely flexible— almost too flexible. It has often been referred to as the ‘Swiss Army Chainsaw’ of collaboration and documentation platforms. This is because there’s a massive amount of features bundled into one very large package, and if you’re not careful you’ll cause a lot of damage. Understanding the pros and cons of SharePoint isn’t as simple as a checkbox of features. Corporate culture, management ideals, risk tolerance, IT resources, and many other considerations all carry weight in determining the potential success of a SharePoint implementation. Where exactly that weight is distributed will depend entirely on your organization. While SharePoint is undoubtedly a big, complex, but highly functional tool, your success with it largely depends on your specific environment. While many organizations have found success with a SharePoint intranet, others have found it too challenging to manage or completely unnecessary. No matter where your business falls on this spectrum, there are some factors to consider when determining the best collaboration technology for your organization. The user experience of SharePoint is an ongoing frustration, although not too surprising considering it wasn’t exactly designed for end users. In fact, SharePoint was never designed to be an intranet. While Microsoft has attempted to address usability with things like communication sites, there are still a lot of frustrations. The admin interface is limited, IT is required to retrofit to an existing site, and there is no ability to source content from more than one site. Some even argue that SharePoint is the most complex application included in Office 365. Questions to ask yourself: Do we actually want an intranet? What is the outcome we are seeking? Creating and defining an ideal SharePoint intranet takes a tremendous amount of planning, managing, implementing, and teaching. Before going down the SharePoint path you should conduct a deep cost/benefit analyses when evaluating projects for UI design changes. Such customizations are not exactly trivial undertakings and could evolve into extensive projects. SharePoint out-of-the-box provides simple workflows and functionality that may not require a developer, but to achieve a sufficient level of automation or additional business processes and documentation, intense customization is necessary. Questions to ask yourself: Do we have extensive resources available? Will we need to outsource it? Because SharePoint requires involvement from IT, it becomes a shared responsibility between Communication and IT. The complex permission structures and site creation processes are too intricate for most communication professionals to handle. Hub Sites (Microsoft’s approach to SharePoint Online intranets), for example, require a lot of effort to rollout. The challenge is that an intranet is predominantly a communications project. But, SharePoint is an IT project. So unless these departments are in this together, there may be some friction and frustration. If a communications team is left to manage a SharePoint intranet, there will be challenges. Questions to ask yourself: Who will oversee the project? Who will manage the day-to-day usage? Another source of frustration surrounds the costs that can unexpectedly pile up. The inclusion of SharePoint within Office 365 has led many to believe that SharePoint is free. But this couldn’t be further from the truth. Perhaps you’ve seen the infamous iceberg image that depicts a small visible portion as the known costs, and the massive unexposed portion as the invisible costs. The visible costs can include licenses, training, support, branding, and consultancy, while the hidden costs can include things like unique customizations, third-party integrations, continuous product development, and add-on software costs. Questions to ask yourself: Do we have the budget? Do we have a contingency budget for unexpected costs? Adoption is a continuous sore spot for SharePoint. Recent data revealed only 2% of Office365 users actually use SharePoint online. Employees today expect an experience similar to applications like Facebook and LinkedIn, but SharePoint doesn’t offer that. Without intense customization, it can resemble a stale content repository, rather than a vibrant employee intranet. Frustrated users either craft their own workarounds or end up completely abandoning the platform. When this happens, it can be challenging to regain adoption even when management gets involved. Also, low adoption means low return on investment. And when employees abandon it for their own collaborative solutions, this can create gaps in compliance and opens your organization up to security risks. Questions to ask yourself: How will we ensure high adoption? How will we ensure an ROI? When Might SharePoint be a Good Option? There is an abundance of tools and features in SharePoint that will likely excite even the most phlegmatic of developers. So, if your organization is armed with developers who enjoy Lego and assembling Ikea furniture, then the SharePoint ride might be a smooth one. SharePoint is a good idea when you have a demonstrated need for specific features that SharePoint proves and you have a talented internal team to handle customizations (or a large budget to spend on external consultants). Also, if you are knee deep in a SharePoint implementation the last thing you want is a reminder of how SharePoint isn’t going to deliver what it promised. But this doesn’t preclude you from exploring supplementary options. As demonstrated below, SharePoint aficionados can still successfully manage both a SharePoint and ThoughtFarmer intranet. Miguel Tena, Office 365 Consultant at 2toLead, is a SharePoint fanatic. He enjoys lending his expertise to building and maintaining intricate SharePoint sites, and leveraging it for things like documentation storage. But when it comes to active employee engagement and communication, he considers ThoughtFarmer a prime tool for the job. “Creating a page in ThoughtFarmer is simple for everyone. Employees can easily comment and follow. With SharePoint, there are more tricks to remember and even then not everyone will be satisfied with the layout. ThoughtFarmer makes it easy for comms teams to deliver important information easily and keep employees engaged,” said Miguel. And while Miguel enjoys putting his SharePoint skill set to use, he also understands the limitations of SharePoint. Leveraging both SharePoint and ThoughtFarmer at the same time isn’t exactly a common scenario, but thanks to a new Office 365 integration, ThoughtFarmer makes it easier to manage than ever before. The latest version of SharePoint enables users to see Office 365 documents, including those on SharePoint from within their ThoughtFarmer intranet. And for SharePoint enthusiasts like Miguel, having everything integrated and visible helps boost their productivity and bring the best of both worlds together. When might SharePoint not be a Good Option? Dedicated intranet products are often designed around pillars of engagement, business efficiency, communication, collaboration, and knowledge share. If you want your intranet aligned with your core business values, then a dedicated intranet product will be a better fit. As mentioned previously, some argue that SharePoint isn’t even an intranet, but rather a CMS, a database, a document management system, or simply a workflow solution. And as is often the case, a SharePoint intranet deployment can take on a life of its own. According to Gartner “most organizations underestimate SharePoint’s maintenance and service costs.” These can be two or three times more than the initial license price, once add-ons are deployed. There are even documented reports that reveal cost overruns of up to 100 million dollars. And as Capital Region BOCES realized, sometimes the best intentions can grow into an unexpected outcome. Capital Region BOCES is a New York-based non-profit governmental agency with 1000+ employees that provides cost-effective, shared services for school districts. Like many organizations in the public sector, initiating change internally isn’t always easy; especially when it comes to technology. Their senior employees recognized the need for a modern intranet, when they realized that some of their internal resources were left on a public facing website. With the help of a a few brave souls from Communications and IT, Capital Region BOCES first tried building an intranet from SharePoint. Thinking they had finally (after numerous attempts) achieved the intranet of their dreams, the Capital Region BOCES staff were initially excited. However, the final SharePoint site wasn’t exactly what they had envisioned, and it was quickly disbanded. While useful in some circumstances (they still rely on SharePoint for other projects etc.) SharePoint wasn’t a fit for their internal communication needs. While searching for a new dedicated intranet solution, Capital Region BOCES discovered ThoughtFarmer. They were immediately attracted to its feature set which extended far beyond document management. “It was as if we had been wandering in the desert for 10 long years and now FINALLY found our tribe hanging out at this chill social intranet oasis asking what took you so long?” said former Director of Communications, Deb Bush-Suflita. Their driving force was the recognition that good intranets solve organizational problems that are too costly to continue to ignore. And because the ThoughtFarmer team was there to guide them through the journey, the Capital Region BOCES team saved a considerable amount of time and money. If you are an Office 365 user, chances are you still want to get the most from your investment; because in all likelihood you rely on many of the other applications within the suite. ThoughtFarmer easily integrates with Office 365, creating a seamless digital workplace experience. Users can search and access the most up-to-date versions of their Office 365 documents, without ever needing to leave your intranet. ThoughtFarmer also comes with pre-built integrations to Google Drive, Office 365, SharePoint, and Okta. The platform supports authentication with every major SAML provider—including Azure AD, Google Suite, OneLogin, OKTA, Ping Identity—as well as on-premise Active Directory which allows for Single Sign On. 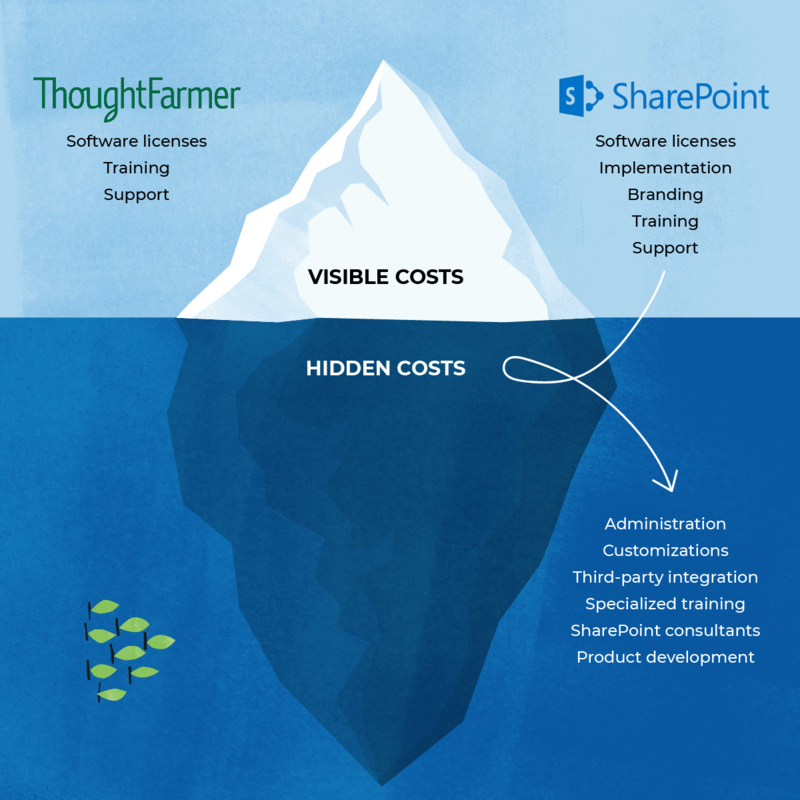 As you can see, SharePoint and ThoughtFarmer can coexist with each other, but first you need to understand your current infrastructure, how your employees work, what budget and resources are available. From there you can select a solution that best meets your organizational needs. For those of you who are in the beginning stages of an intranet journey, we recommend reading How to Build a Business Case for you intranet. It’s a fantastic resource for understanding what solution is best for you, how to tie it into your organizational goals, how to measure success, and how to ultimately gain stakeholder approval.